Contributed photo | Mary Draper, sitting, speaks with a student at Scotland High School during Career Day about Vocational Rehabilitation and how the organization can help with college and career. Navy officers, Mario Carney, left and Victory Bullard, right, share their experiences in the military with Scotland High students during Career Day. 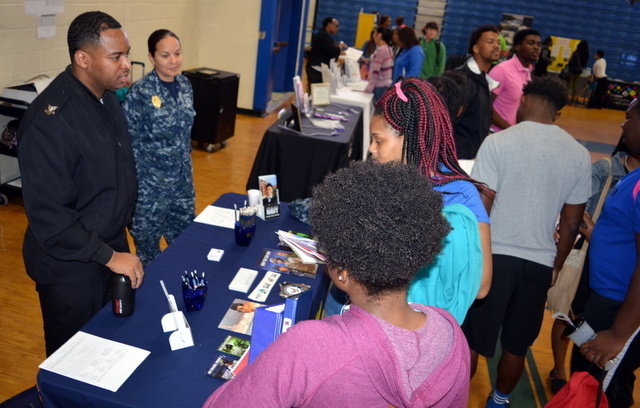 LAURINBURG — Students at Scotland High School got the opportunity to consider different occupations during recent the second annual Career Day. 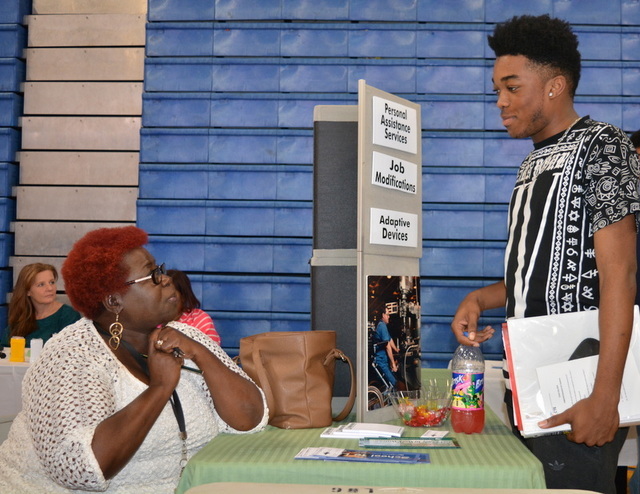 Vonda Graham, Career and Technical Education coordinator at SHS, said the Laurinburg-Scotland County Area Chamber of Commerce and partners with the Scotland County Schools Career and Technical Education Department helped in the selection of the businesses and organizations. The staff made sure all 16 national career clusters were represented. “This year we organized the event specifically for current juniors and seniors . Based on the feedback from our last career day, we found employers wanted more time to share with those soon entering the workforce and deciding on a major for college,” said Gorham. There were 45 businesses, industry and post-secondary institutions that participated this year. “The career day went a lot smoother with just eleventh and twelfth grade students this year. They seemed to be more involved with the employers,” said senior Taylor Jernigan, who has helped with the event for the past two years. Career and Technical Education Director Dr. Camille Goins said the event takes a lot of preparation but she wants to make sure the students have a valuable, meaningful and learning experience. Mario Carney and Victoria Bullard were at the event as recruiters for the United States Navy. “I like how you have different jobs instead of colleges so they can kind of get an idea of what to expect outside of school, outside of college, even if they need a degree to get that job,” Carney said. “They have an idea of what career fields they can get into. They have other options,” he said. He has been in the service for six years, while Bullard is new to the military life, just enlisting in November. Carney said he tells students he joined the military to travel and has been to eight countries. Originally from Virginia, he added, he said he would have never been able to see the world as he has if he had not enlisted. “I have stability and I’m secure. I have a stable paycheck, I have medical insurance. I like being able to be in control of my career path,” he said. Mary Draper with Vocational Rehabilitation was also there. Her organization helps individuals with disabilities find employment and get additional education. Job seekers are able to get help with their resume, counseling and improving their job seeking skills.